Sunny skies and steady sea breezes have welcomed the 12 international teams for the start of the 2016 HARKEN International Youth Match Racing Championship on Pittwater. With the wind strengthening from the east to northeast throughout the day it showed the newcomers what they were up against sailing in Pittwater’s shifty conditions. Matthew Hughes from the Royal New Zealand Yacht Squadron coming into his first HARKEN as a skipper has shined on the first day finishing the day with six wins from seven races. Local sailor and HARKEN veteran, Malcolm Parker from The Royal Prince Alfred Yacht Club showed off his local knowledge and experience in the first day with five wins from six races having lost one race to George Anyon from the Royal New Zealand Yacht Squadron. “It was good out there today, it’s was pretty standard Pittwater conditions today so we felt comfortable and it was good to get the wins.” said Malcolm Parker. Anyon also showed off his knowledge of Pittwater with an equal scorecard to Parker with five wins from six races with an upset loss to Sarah Parker. Sarah, Malcolm’s sister skippers the only all girl team of the event and really stepped it up against the highest ranked skipper. The Darwin team skippered by John Lynch couldn’t stack up a win during the day but sailed some strong races. Tom Vincent, a crew member on the team was happy with how the day progressed. “It was a long day today but I think the team are starting to figure out the boats. We haven’t done much match racing or sailed Elliot 7s before but after today’s efforts I think we’ll be better tomorrow.” said Tom Vincent. Sitting on 100% with four from four is Will Boulden from the Royal Freshwater Bay Yacht Club who handled the conditions very well but will need to continue his consistency going into the second day of racing. The forecast for day two of racing is looking like a much warmer day with a high of 32 degrees with testing winds from the west. 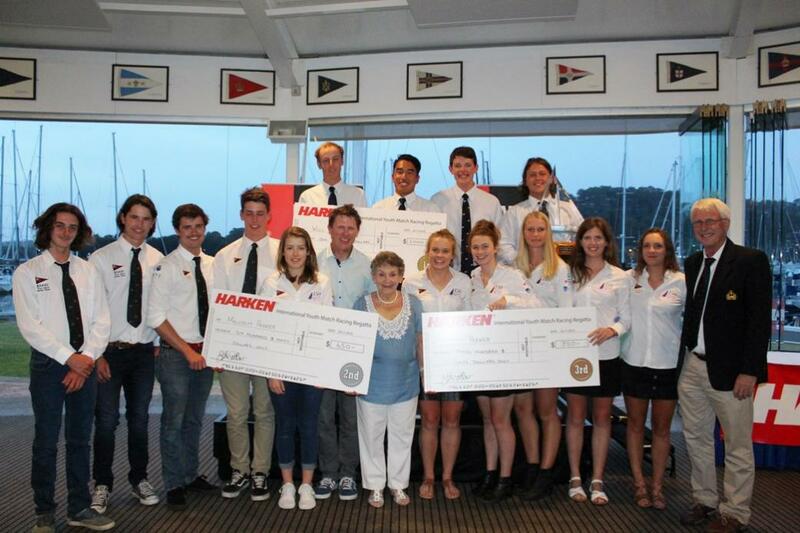 The 24th annual HARKEN International Youth Match Racing Championships, hosted by The Royal Prince Alfred Yacht Club welcomes the continuing support of HARKEN Australia as its naming rights sponsor.The Championship is scheduled to be held from Wednesday 16 November to Sunday 20 November 2016. Will Boulden from the Royal Freshwater Bay Yacht Club has maintained his consistency from day one to finish up undefeated on the second day of HARKEN International Youth Match Racing Championships with a scorecard of nine from nine. “We had a good day out there, we had some good moments but there were a few areas which we will need to work on but in the end we got across the line.” said Will Boulden. With fickle winds from the west shifting to the north caused some headaches for the race managers but the wind eventually settled to a steady 8 to 12 knot northeaster presenting a similar racetrack to day one. Malcolm Parker (RPAYC) has also maintained his consistency coming in second followed closely by George Anyon (RNZYS.) Both are sitting on two losses however Malcolm has won one more race which has pushed up his percentage. RPAYC Coach Tom Spithill was very happy with both Malcolm and Anyon’s progress and is excited coming into the final days. Climbing up the point score ladder notching up some solid wins on day two is Will Eastman from the Royal Port Nicholson Yacht Club (NZ) with seven wins from ten races and will be one to watch coming into the final round robins on day three. The team furthest away from home, Jalmer Van Beek representing the Dutch Federation Yacht Club has had two solid days of racing with an upset with over Malcolm Parker in one of the earlier races. With a little help from crew member, Will Dargaville, who is a RPAYC local the Dutch team have come away with four wins from nine races. Tomorrow’s conditions are taking a swing with the south with a predicted 15 knot southerly to hit before dawn and decreasing throughout the day which will change up the racetrack for the final day of round robins. Semi-Finalists Announced On Day 3! 2016 Harken International Youth Match Racing Championships – Boulden, Sarah Parker, Malcolm Parker and Hughes to semi-finals! A shifty 10-15 knot southerly tested sailors on day three of the 2016 Harken International Youth Match Racing Championships with semi-finalists decided. Race Officer Ted Anderson pushed through to complete the Round Robin, Quarter Finals and 9th- 12th place sail offs ahead of tomorrow’s light North-Easterly forecast. Will Boulden and his Alpha Racing Team from Perth took out first place in the round robin and elected to compete against Jelmer Van Beek from the Netherlands. Boulden continued his strong performance to secure a place in the semi-finals after convincingly winning three from three races. Second ranked team into the Quarter Finals was Royal Prince Alfred Yacht Club’s Malcolm Parker who chose to sail against Oakley Marsh from Wellington. Parker dropped one of four matches after trawling his kite but finished the day with a convincing lead on Marsh to take out the second place in the semi-finals. Sarah Parker and her all female team from Pittwater were chosen by Will Eastman from Wellington, New Zealand. The girl’s local knowledge and clean crew work helped them to win three from three close races and take out a spot in the top four. Race two between the teams had Sarah Parker leading off the line with a penalty and clearing it on the final leg of the race. In the final match between the pair Sarah lead around the track and in a nail biting finish crossed just second ahead of Eastman on the line. George Anyon and Matthew Hughes were left to fight for the last place in the semi-finals in a ‘Mate V Mate’ sail off that went to five races. The training partners from Auckland harbour left it all on the track with Hughes eventually taking out the final top four spot. Places 9th – 12th duelled in a sudden death format to determine their final placings in the dying afternoon breeze. Late in the afternoon Match 1 of the Semi Finals was undertaken with Will Boulden electing to compete against Sarah Parker in their Semi Final leaving Malcolm Parker to race Matthew Hughes. The first to score 3 points will progress to the final. Will Boulden and his Alpha Racing Team from Royal Freshwater Bay Yacht Club in Perth have taken out the 2016 Harken International Youth Match Racing Championships after four days of racing at the Royal Prince Alfred Yacht Club! The team of Mark Wong, Alex Negri and James Farquharson faced off against local sailor Malcolm Parker and his team from the RPAYC in some of the closest match racing that we have seen at the Harken! Boulden thanked the Royal Freshwater Bay Yacht Club and Harken for putting on the event. He is ranked 46th in the ISAF Open Rankings and is just 20 years of age, making him one of Australia’s rising youth match racers to watch in the future. Third placed skipper was the RPAYC’s Sarah Parker and her all female team who were up against the Royal New Zealand Yacht Squadron’s Matthew Hughes. Racing went to three flights with a score of 2 to 1 in favour of the girls. Sarah accredited her team’s ability to work together as one of the major contributing factors to her success at this event. Today’s racing was close with both Parker and Boulden fighting hard for the championship title and $1000 prize money for first place. In race one Parker put the heat on Boulden shutting him out above the boat lay-line before Boulden made a sneaky come back over the start boat to win the favoured pin end of the line and win the race. The heat was on in the second race, with both teams pushing early to the start line and Boulden winning the pin end. Despite Boulden rounding the first bottom mark in the lead, Malcolm went on to take the left side of the course on the next upwind and snuck ahead to win the second race. The pressure stayed on in race three with a split tack start and Boulden carrying a penalty. The boats duelled bow to bow on the upwind with Malcolm rounding first but Boulden being able to complete his penalty on the upwind. Race three to Boulden after a close downwind and clean boat handling. This took the racing to a match point where Parker started evenly with a penalty off the line. The teams stayed close on the upwind, Parker rounding just ahead of Boulden at the top mark and then completing his penalty and staying ahead on the next upwind. The final downwind was a testament to the high level of competition seen at this year’s Harken, where Boulden managed to close the gap between the boats and Malcolm was given a double penalty just metres from the finish line. This year, the RPAYC is showcasing its fleet of Elliot 7's for this premier event held on the magnificent waters of Pittwater. 12 teams from Australia, New Zealand, USA and the Netherlands are competing for the $2000 prize purse along with the Rockin’ Robin Perpetual Trophy. George Anyon from the Royal New Zealand Yacht Squadron is looking to the top of the podium after three HARKEN events as skipper. Anyon will start outright favourite for the event with the highest ISAF ranking amongst the skippers following a consistent year on the podium at various youth match racing events. However, he will face tough competition from the other 11 teams including a separate brother and sister team from the Royal Prince Alfred Yacht Club. Malcolm Parker will skipper one team and the other will be skippered by sister, Sarah Parker. Club coach, Tom Spithill tips that the sibling rivalry will bring out the best in them. “It’s like with anything, siblings always want to be better than one another. Sarah’s been progressing really well leading up to the HARKEN and Malcolm, well he’s got more experience. It’s going to be a great showdown when they are up against each other.” said Tom. For the first time ever a team from Darwin Sailing Club will be competing for the Rockin’ Robin Trophy. John Lynch, Darwin’s skipper has never competed in an international match racing event. “I’m really excited to get out racing with the team, back in Darwin we haven’t really practise in anything like the Elliott 7s but we’ve been lucky enough to get out sailing in Pittwater with some of the club racing.” said John. "The HARKEN" as it is known in youth sailing circles worldwide stands out as one of the premier events for youth on the international match racing calendar and has during its 23 year history served as a launch pad for a number of local yachting stars including dual Harken winning skippers James Spithill (and America's Cup dual skipper winner), Michael Dunstan, Steve Jarvin, Torvar Mirsky and more recently William Tiller who has since become a rising star on the World Circuit.